Paul Rudolph began his career in 1941 as an apprentice, and later partner in Ralph Twitchell's architectural practice in Sarasota, Florida. Together their work became known as part of the "Sarasota School" of architecture. Common characteristics of the Sarasota School of Architecture are a strict adherence to function, modular composition, articulation of individual building components and attention to local climate and terrain. Large sunshades, innovative ventilation systems, oversized sliding glass doors, floating staircases, and walls of jalousie windows dominate many of these buildings. Rudolph and Twitchell's projects gained recognition in part due to the stylized ink renderings produced by Rudolph during this period. In March of 1952, Rudolph left Twitchell's office to open his own firm and began traveling between Florida and New York to lecture at various schools in the Northeast. Rudolph re-examined his early work in Florida and was not satisfied with its quality, concluding that it lacked sufficient psychological control of light and space. He started to question the fundamentals of the International Style and the rigid principles of the Sarasota School. In 1954 he was awarded the "Outstanding Young Architect Award" in an international competition and the resulting recognition led to larger projects around and outside of Florida. 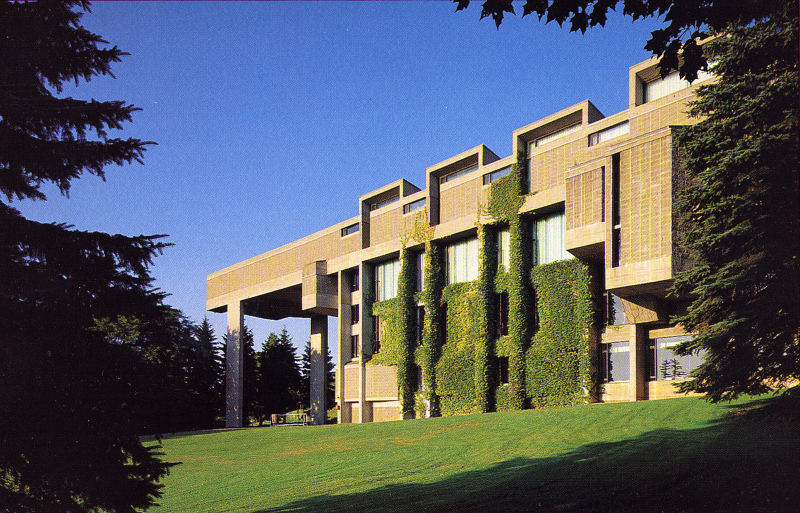 Paul Rudolph was offered in 1957 the Chairmanship of the School of Architecture at Yale University and opened another office in New Haven, Connecticut. Rudolph continued to build projects in Sarasota during this period, which are notable for their emphasis of mass and expression over the previous focus on light materials, modular bays and prefabricated components. Up until his time at Yale, Rudolph's work had been a progessive exploration of modularity and functionalism. Designs produced during the 1960's began to focus more on expressive forms made of poured in place concrete, the control of light and shadow, the play with scale and composition of different types of space. The most notable difference in this work is the focus on flowing curving lines and sculptural masses, the articulation of the buildings resulting from exaggeration of the shapes of the functions within. In 1965, Rudolph moved his offices to New York and by the end of the decade focused on creating complex compositions using simple modular elements. Influenced by Moshe Safdie's prefabricated housing at the Montreal World Fair in 1967, Rudolph predicted that mass-produced mobile homes would become the basic building element in the future. Scale at the human level, the building level and the city would dominate his work during the later half of the 1960's. A fire at Yale's Art & Architecture Building in 1969 and the 1972 publication of 'Learning from Las Vegas' contributed to a questioning of Rudolph's Modernist aesthetics during the 1970's. The amount of work declined, with most of the projects being private residences and a few large commissions. Rudolph continued to explore themes of scale and modularity, with a special emphasis on the experience of scale with regard to highrise buildings. By the 1980's, Rudolph began to receive several large commissions in Asia. These projects were located in primarily dense urban settings, and his work of this period focused on developing a scale and complexity necessary to relate the building to its surrounding context. Rudolph developed a tripartite expression of scale in his larger commissions to distinguish between the individual's perception of scale of the building's base, the perception from the automobile of the middle of the tower, and the top of the building from far away. As more of Rudolph's work shifted from the United States to Asia, he explored materials and building forms to relate his Modernist designs to the unique character of the regional architecture of the building's location. In the last decade of his life, Rudolph explored the application of traditional building forms with his modernist aesthetic in large scale projects in Singapore, Hong Kong and Indonesia. On August 8, 1997 Paul Rudolph passed away in New York City from mesothelioma, a cancer that usually results from exposure to asbestos. At the time of his death he was working on plans for a new town of 250,000 people in Indonesia, and a private residence, chapel and office complex in Singapore.